What does winning the award from the Small Business Administration mean to you? I do what I love, so it’s hard to fathom getting an award for work you love to do. It’s extremely humbling, especially when considering the people who have previously received this award. Two years ago, I was at an event where Gale Castillo, Hispanic Metropolitan Chamber executive director, received the same award. It never crossed my mind that I would receive this honor. What is your primary charge in your role as business development coordinator at the Hispanic Metropolitan Chamber? My primary charge is to help people navigate systems in place for small business owners. People may see these systems as obstacles, others may see them as opportunities. I serve as a guide to enable them to use self-employment as a vehicle for wealth creation or establishing their own future. My role is to help people accomplish their goals. What I enjoy most about my work is being around this energy, this desire that people have to reinvent themselves. The people I encounter are always working toward achieving more than what is expected of them. They take control of their destiny, and their future. It’s very rewarding to see their dreams come into fruition. On the same vein, it’s just as important for people to realize when starting a business isn’t a viable plan. I also work with people who realize that business ownership isn’t a good fit, and that it’s more important to concentrate on employment. What was your career path prior to joining the Hispanic Chamber? I’ve always gravitated toward entrepreneurship. I come from a farming community. Seeing the products of one’s labors has always been ingrained in our family. We planted bulbs, grew them, then took the flowers to market. After college, I went to work for an environmental planning firm then did an internship at an architectural firm. I began working in quality control for a construction firm, and from there, I worked in procurement for the Department of Energy. That’s where the strong focus of my work on construction and procurement comes from. There was always a part of me that wanted to venture off and strike on my own. I owned a catering service business for 10 years. When I moved to Oregon, I started Montesi and Associates as a vehicle to help people who want to work as consultants. It was an opportunity for me to put my skills to work, in terms of setting a roadmap for would-be business owners. In time, I began working in certification for minority and women-owned businesses. Eventually, I joined the Hispanic Chamber in my current role. My experience as a business owner was helpful in my work as a guide for small businesses. When your livelihood depends on your own efforts, you tend to have a different view on finances, and how the business should operate. Running Montesi and Associates in Oregon allowed me to learn about contracting systems and tools that are out there for small business owners. Conducting training and offering counseling to small businesses is easier, because I myself understand what it’s like to be a small business owner in this market, trying to generate contracts and stay afloat. How does Montesi and Associates differentiate itself from other firms? Our approach is very innovative and focused on thinking outside the box. We don’t simply put a template out for small businesses. We look at how people operate their business, and come up with creative strategies to work smarter. A lot of times, people tend to work harder than they have to. Montesi helps businessowners identify opportunities at enhancing ways of working, so they become more effective. Your work focuses on ensuring diversity is at the forefront of business decisions. Why is this important? It’s important to diversify in terms of suppliers and contractors, to make sure that you’re not relying on only one source. What happens when that source of goods, services and labor goes away? Firms also have to reflect the communities that they are serving. This has implications in employment, contracting and other functions. We’ve come a long way from the days when firms would only take from a community, and not give back. If businesses are to survive and thrive, they must be socially responsible. Diversity is an important ingredient in corporate social responsibility. Here in Oregon, we have a huge concentration of women-owned businesses. We’re beginning to have more Latino-owned businesses. Still, in Oregon, we’re still in the early stages of establishing diversity as a business must-have. If you look at the firms and agencies that do the most work in ensuring diversity, many of those firms are in the Portland metro area. There are very few firms and agencies outside the Portland area that are doing anything about diversity at all. In terms of diversity, businesses have gone deeper than simply putting diverse faces in the forefront. Increasingly, people from diverse backgrounds are in decision-making positions. We’re also seeing more government agencies that are requiring private firms and contractors to show procurement practices that promote diversity. Firms that are responsive and responsible for their diversity footprint will end up being winners in the long run. What do you find most challenging about your work? Opposition to change. Some people tend to have this fear that by doing something differently will result in negative outcomes. Locally, there are certain populations that are starting businesses at a much different -- often lower –level than others. There aren’t support systems in place to help these businesses grow, so they can become the types of businesses that we want in our communities. Startup businesses are struggling, and many don’t make it. I think that’s a huge missed opportunity. Making an investment in new businesses would go a long way in growing strong and successful companies that would help project our goals for our community. What aspect of your work are you most proud of? That’s hard to say. It makes me really proud to know that in our communities, there is a significant amount of people who have been able to realize their dreams, ambitions and goals. It’s rewarding to know that I have been with them along the way, offering assistance and encouragement. Here at the chamber, our work with Latino businesses impacts families, multiple generations. Just by showing kindness and support for people wanting to start their own businesses, we’re helping transform the community we live in. How does your cultural background impact the way that you lead? I don’t know if this is cultural – but having the mindset that anything is possible has made a huge impact in the way I work with people. I learned at an early age that when you hear the word “No,” you’re speaking to the wrong person. No matter what I hear, and no matter what obstacles people have, I believe that there’s a way to make things happen. Perhaps that’s naïve or idealistic, but I have this strong belief that if people decide to create something, they can do it. I learned a long time ago never to tell someone with a business idea that their plan is not going to work. In the most saturated market, I would point out that challenges exist. I always find it amazing how people always find a way to overcome obstacles. I am of Puerto Rican descent, and raised in New York. I come from a large family, and everything is about community. Anything you do impacts everybody else, so there’s this consciousness that you’re responsible to the community that you live in. Here in Oregon, we have the uncanny ability to impact our surroundings and create change. Compared to other places, Oregonians have greater access to politicians and private sector leaders. What’s on your wish list? The ability to continue to support the community that I live in, in anyway possible. My wish for Oregon is to be able to create the community it wants to have: diverse, sustainable and thriving. I wish that people can continue to come here, raise families, and be able to afford to stay here. Make sure that we’re not leaving anybody behind. My wish is for these values to be passed to the next generation of Oregonians. "When your livelihood depends on your own efforts, you tend to have a different view on finances, and how the business should operate." "What I enjoy most about my work is being around this energy, this desire that people have to reinvent themselves. The people I encounter are always working toward achieving more than what is expected of them. They take control of their destiny, and their future." " It makes me really proud to know that in our communities, there is a significant amount of people who have been able to realize their dreams, ambitions and goals." Colόn joined the Hispanic Chamber in 2003 and is responsible for providing technical business services to small business owners as part of the Hispanic Chamber's Business Assistance Program. Since 2002, the Hispanic Chamber has assisted over 1,600 businesses throughout Oregon and SW Washington in a variety of areas including: accessing financing, purchasing business properties, and identifying contract opportunities. Colόn has strong experience in vendor diversity programs, construction management, and knowledge of local government and community resources. 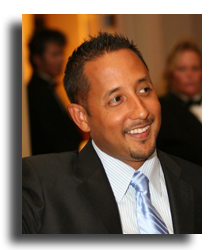 He has over 10 years experience analyzing, designing, consulting, managing and auditing vendor diversity programs in both the public and private sector. In addition, he has worked as a Compliance Specialist for the State of Oregon's Office of Minority, Women and Emerging Small Business certifying businesses and conducting outreach to minority business owners. He has worked with the Port of Oakland, Office of Civil Rights/Cordoba Corp. in Oakland, California, as a DBE Eligibility Auditor; and the US Department of Energy/Cordoba Corp. as a Project Manager, working with financial assistance and procurement programs.